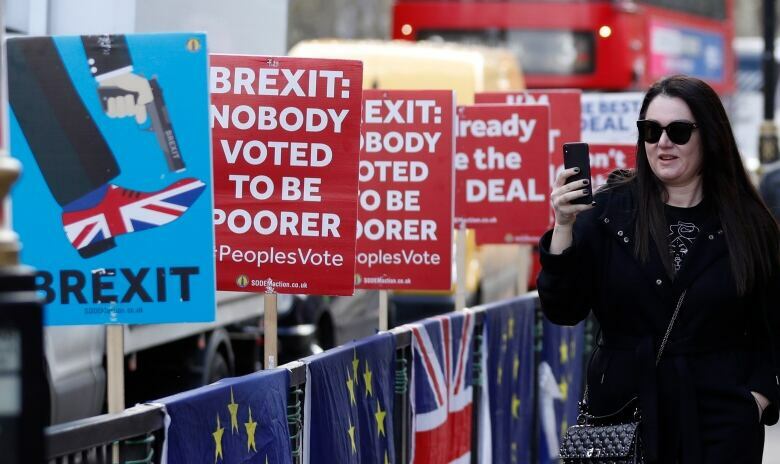 For two years, Britain has been telling the world it will quit the European Union at 11 p.m. London time on March 29, 2019. Prime Minister Theresa May has made it her priority ever since she took office. Now, the U.K. is taking a longer route on its road to Brexit, but why? Is the breakup in doubt? Where is this headed? CBC explains. As it stands, Britain could quit the EU on April 12 or May 22. May is also leaving the door open to a later exit. Britons had been led to believe Brexit would happen on March 29, two years after the prime minister triggered the Lisbon Treaty’s Article 50, the mechanism by which a member state leaves the bloc. The departure date depends on whether British MPs finally approve May’s EU withdrawal agreement, which she considers key to an orderly breakup. The House of Commons has already defeated it twice. The EU has decided that if British lawmakers approve the deal, Parliament can then be given a few extra weeks to pass other Brexit-related legislation and leave on May 22. If Parliament again dumps the agreement, the government must come up with another plan by April 12 or risk crashing out with no deal. The prime minister is also threatening Leave supporters with a “slow Brexit” — meaning a longer delay — if they don’t approve her departure package. 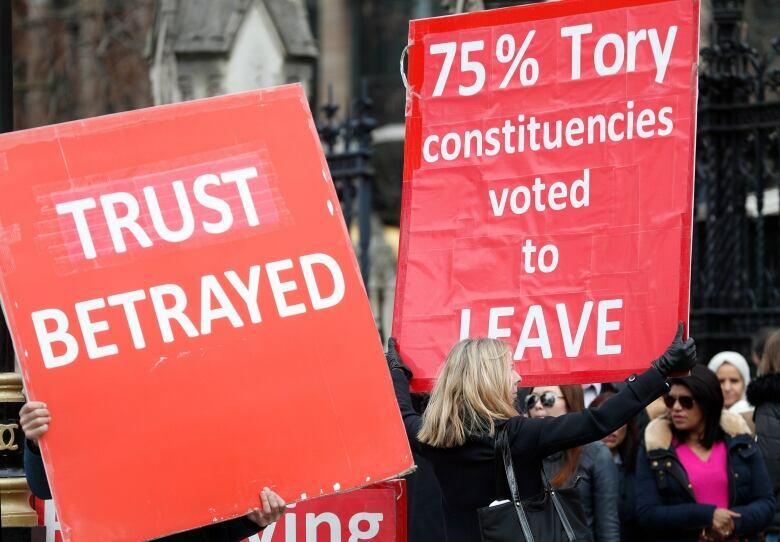 Although a slim majority (52 per cent) of British voters chose in June 2016 to leave the EU, lawmakers still can’t agree on the best way to break up. Some prefer a “hard Brexit,” which would see the U.K. keep no ties to the EU. Others prefer a “softer” departure, meaning the country would maintain a close relationship to the bloc, even as a former member. As the end of March approached, MPs in London realized they were running out of time to agree on an exit plan, so they voted to request an extension. The prime minister set her new preferred date as June 30. The 27 other EU member states had their own ideas, though. They decided on a two-pronged plan, imposing the April and May dates as new deadlines, depending on whether the British Parliament would sign off on the deal. European Council President Donald Tusk laid out the options, saying the British government “will still have a choice of a deal, no-deal, a long extension or revoking Article 50,” which would mean cancelling Brexit. A longer extension would also increase the likelihood that Britain would be forced to take part in European parliamentary elections in two months. Why do the EU elections matter? In late May, voters across the EU will head to the polls to elect each country’s members of the European parliament (MEPs) based in Strasbourg and Brussels. Britain didn’t intend to field candidates, nor did voters expect to cast ballots, since the U.K. was supposed to have left by then. But if Brexit still isn’t sorted out, Britain faces the prospect of taking part in the elections anyway, and being tied to a major EU institution for the foreseeable future. The EU had already intended to redistribute seats left vacant by British MEPs. And major U.K.-based parties haven’t started planning for a spring election. “It would be viewed widely by the electorate as a joke election,” May’s former spokesperson Joey Jones recently told CBC News. “I shudder to think who they might end up voting for in that circumstance. “That would be disastrous,” he said. A majority of British MPs dislike the 585-page divorce deal the prime minister struck with the EU. It would essentially see Britain temporarily remain a member state without having the right to vote on decisions that will still affect Britons. The deal would see the U.K. be subjected to European law and pay EU institutions until a transition period expires on Dec. 31, 2020. In the interim, British and European leaders would negotiate their future relationship and a free trade deal to come into effect once the transition period is over. There’s also the whopping divorce bill that Britain would be on the hook to pay, to the tune of £39 billion (almost $70 billion Cdn). May has signalled she won’t bring the agreement back for a third vote until she thinks it has enough support to get past the line. 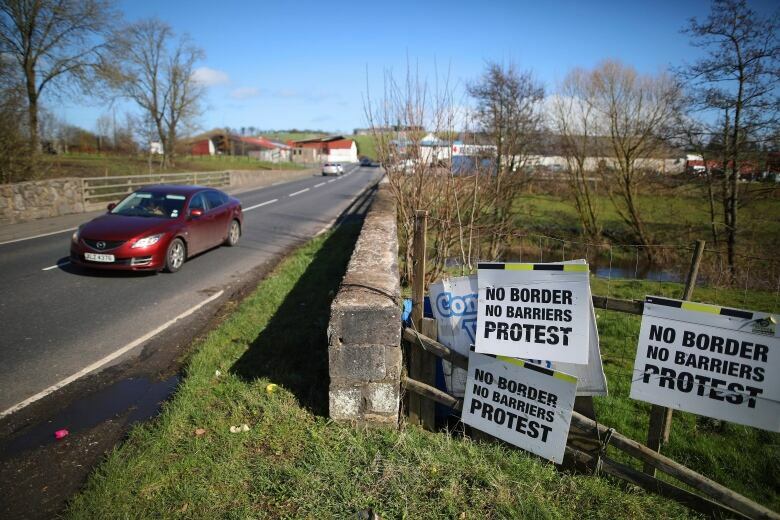 The main sticking point preventing many Brexit-supporting MPs from approving the deal is the Northern Ireland backstop. But Brexit means the land frontier will soon separate the EU from a non-member state. And that raises a series of challenges related to the flow of goods that meet EU standards, and those that don’t. The backstop is only meant to come into force if the Brexit transition period (laid out in the divorce deal) ends before the U.K. reaches a trade deal with the EU. That wouldn’t happen until the end of 2020, at the earliest. If ever the backstop did come into effect, the U.K. would continue to follow European customs rules. 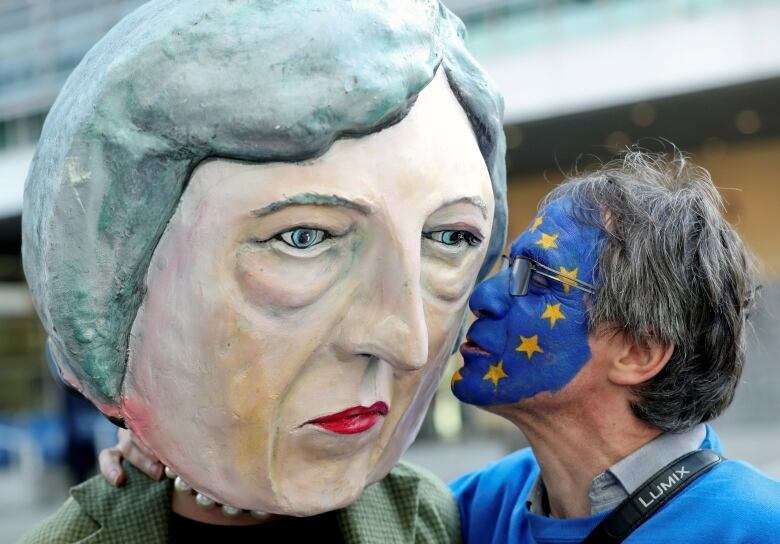 Brexit supporters fear that could be the EU’s way of keeping Britain in its orbit for years after the supposed breakup. And with Britain prevented from developing its own independent customs policy, the backstop would also prevent the U.K. from striking its own trade deals with countries such as Canada and the U.S.
Could all the delays lead to Brexit being cancelled? Millions of Britons hope so. More than 5.7 million have signed an official petition on the British Parliament’s website demanding Article 50 be revoked. When the petition was posted last week, traffic was so intense that it briefly crashed the site. It’s hard to ignore the noise from the street, too. 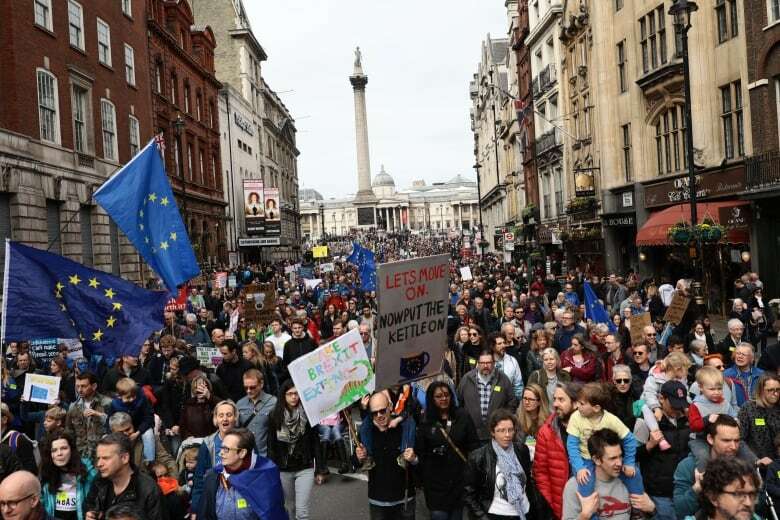 Hundreds of thousands marched through London last Saturday to demand a second referendum on EU membership. It’s believed to be one of the biggest rallies the British capital has seen in recent decades. Brexiteers like to point out, however, that a much larger proportion of Britons — 17.4 million voters — chose “Leave” in the 2016 public vote. And a major roadblock to Brexit’s cancellation is the makeup of the House of Commons. Both the governing Conservatives and the main opposition Labour Party ran the last general election promising to respect the outcome of the 2016 referendum. Only two routes could foreseeably lead to a U-turn. The first option is another general election, which Labour leader Jeremy Corbyn has been demanding. His party’s members tend to support remaining in the EU. They could force him into campaigning for a second referendum with “Remain” as an option on the ballot. The other unlikely alternative is that MPs force the Conservative government to hold a second public vote or cancel Brexit outright. For the record, polls consistently suggest a slight majority of Britons now support remaining in the EU. MPs will vote Wednesday on a series of non-binding measures known as indicative votes. The plan, opposed by the prime minister, was brought forward and approved by Tory and Labour backbenchers. The House of Commons has repeatedly shown what it will not support, but has never indicated what form of Brexit it would actually approve. The indicative votes are meant as a way to finally identity what solution could get the support of a majority of lawmakers. Options could include a softer Brexit with continued access to the EU’s customs union and single market. MPs may instead choose to pursue a free trade deal with the EU similar to Canada’s arrangement with Europe. More dramatic options are likely to be voted on, too. They could include revoking Article 50 to cancel Brexit or calling a fresh referendum. May says she’s “skeptical” of the process and won’t commit to implementing the most popular option. She reiterated the current “default” outcome is to leave the EU with no deal, no matter the political and economic risks. This week will be crucial in determining whether Britain leaves the EU soon or takes more time to reconsider its options.